Page added in January 2018. Photos taken in November 2017. Capua is a walled city, founded 856, by Count Lando and his brothers (from Benevento), on the site of the ancient Casilinum. Augustus J. C. Hare - Cities of Southern Italy and Sicily - 1891. The new town was founded after the Saracens had destroyed the old one in 841. Casilinum, the site where it was built, was a bend of the River Volturno at the eastern end of a Roman bridge. The river provided some defence from other attacks by the Saracens who had established a permanent settlement in the coastal strip around ancient Minturnae. At a later time Capua was involved in dynastic quarrels among the Longobard noble families of Benevento which paved the way for the Norman conquest of the region. 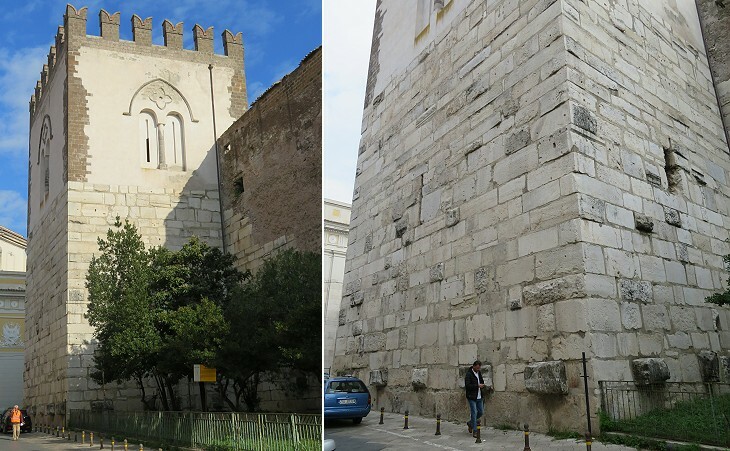 The new rulers strengthened the defence of Capua by building a castle with a large tower. The stones for its construction were taken from those which faced the amphitheatre of the ancient town. 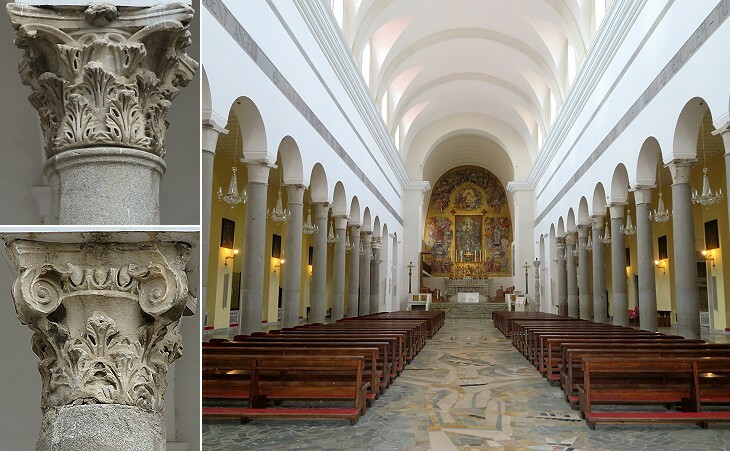 With the foundation of New Capua the old cathedral of S. Maria Maggiore was replaced by a new one for the construction of which ancient columns were employed. The new building, in line with the practice of the time, was preceded by an atrium (see that at Parenzo in Istria which has retained its ancient aspect). The interior of the Cathedral collapsed on September 9, 1943 when it was bombed by the Allies, a day after Italy had surrendered. Only the ancient granite columns survived to this destruction. When the new Cathedral was built almost only granite columns were available, because the white marble ones had been calcined to make lime and those of more precious stones had been used for the old cathedral. 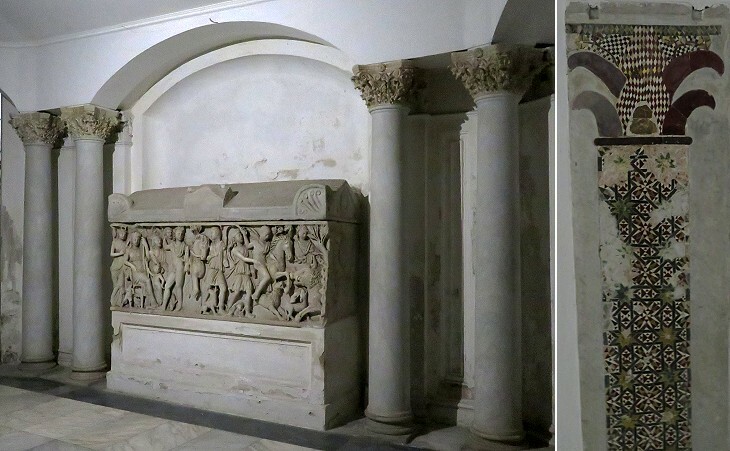 The crypt has twenty-two ancient columns, and contains a sarcophagus with a relief of the Hunt of Meleager. Hare. The crypt was heavily damaged too. The reconstruction could not give it back the aura it had acquired in the previous 1,100 years. 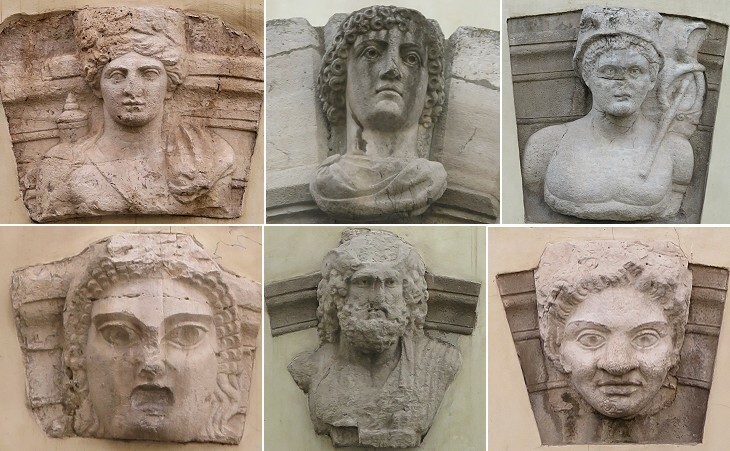 The use of ancient materials as embellishments for new buildings has been widely common in Italy, disregarding the fact that a pagan relief could decorate a Christian facility. 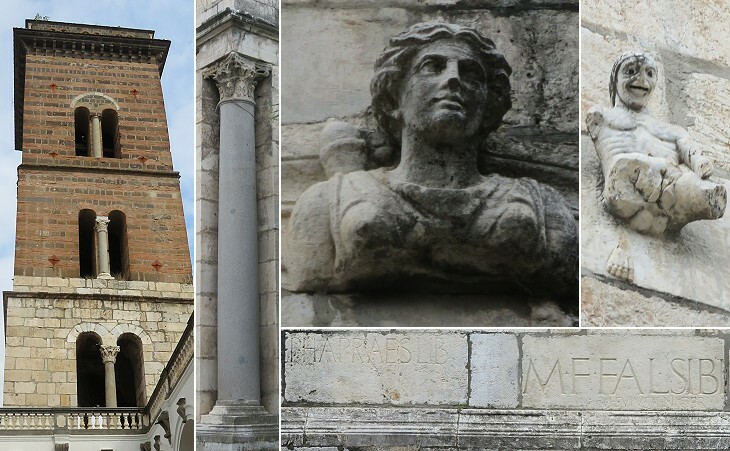 Perhaps the idea to decorate the bell tower of the Cathedral with ancient sculptures was suggested by what had been done at Benevento. In the XVIth century Capua was provided with new fortifications and a State governor was appointed to directly rule the town. Towards the end of that century a palace was built to house his offices. Keystones were found at the amphitheatre and they were used to decorate the new building which was eventually turned into the Town Hall. It was a step towards the conservation of the history of the town. 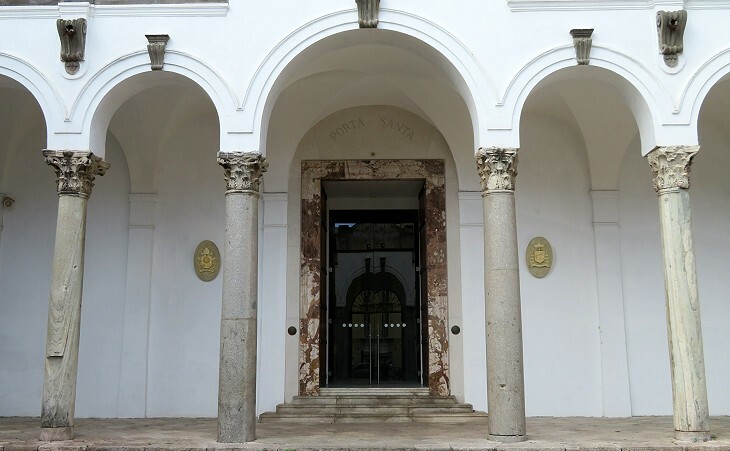 In 1874 a museum was inaugurated at Palazzo Antignano to house the many memories of ancient Capua and its environs which had been found by chance or by proper archaeological excavations. 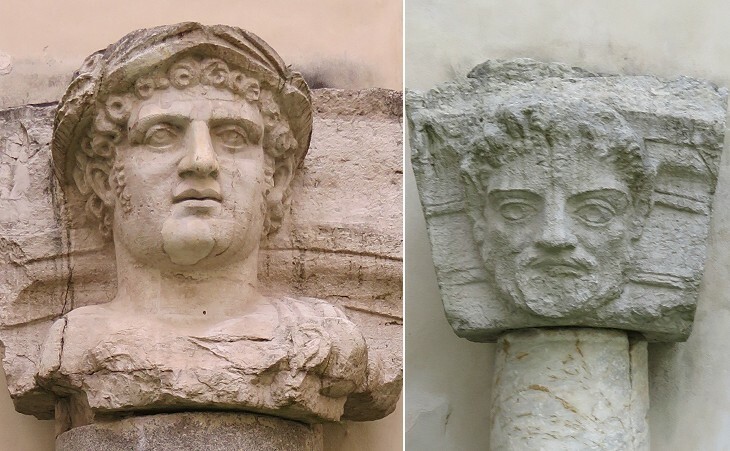 The quality of the keystones of the amphitheatre is not remarkable, but a special care was paid to the design of a bust which was initially thought to portray Apollo, but is more likely to depict Velthur, the god of the River Volturno which was navigable by small boats from its mouth to Capua. The name is of Etruscan origin and it probably means vulture. The inscription above was mentioned in a book by Justus Lipsius, a Flemish humanist and philosopher (1547-1606). It was quoted again by Theodor Mommsen, the great German archaeologist and writer (1817-1903). Its interest lies in its reference to Juvenes Augustales which suggests that the Augustales at Capua were divided into two groups according to their seniority. The Augustales were in charge of the ceremonies in honour of the imperial family and were chosen among the liberti (freedmen). A highly decorated hall where the Augustales met was found at Herculaneum. 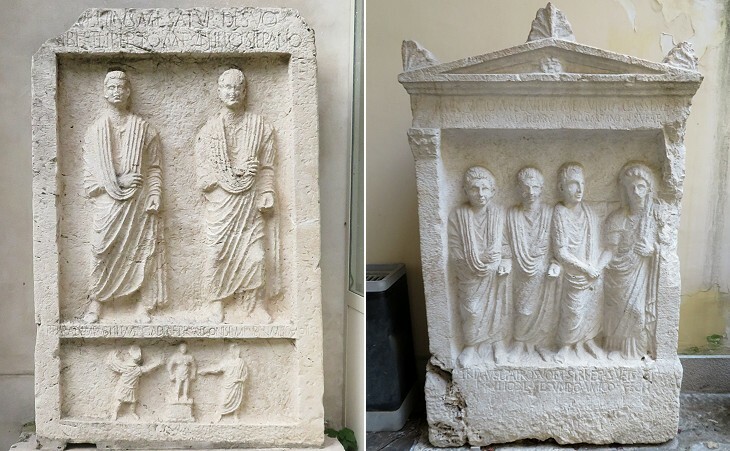 Other inscriptions making reference to the Augustales were found at Formia. Both sarcophagi are dated IIIrd century AD and were made by local workshops. That shown above mixes two mythological tales which both refer to hunters and were usually depicted separately as in sarcophagi found in Sicily and Libya (Hippolytus) and near Rome (Meleager). 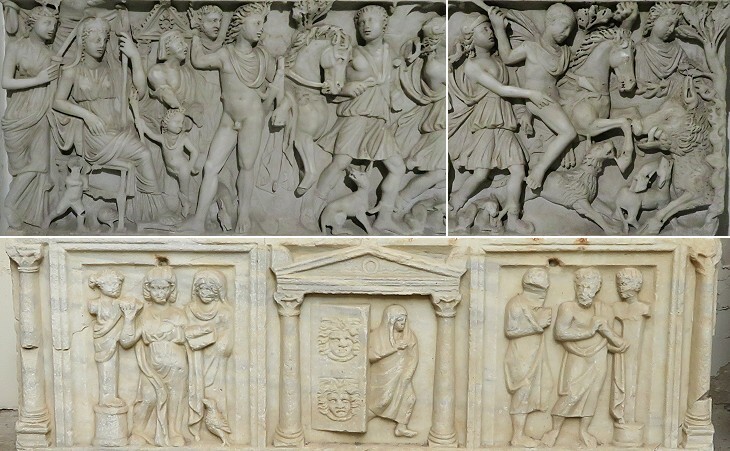 It is therefore a late example of a tradition which decorated sarcophagi with subjects which were not related to death. The second sarcophagus indicates a shift to subjects which were related to afterlife. In the side panels a man and a woman are portrayed with their shadows/souls and a bust of them when they were young. In the central panel a dead woman exits from the Gate of Hades, the Greek Underworld. It is named "Domus Eternalis" because of Christian inscriptions using these words to indicate a sarcophagus, but it is not a Christian sarcophagus. The Gate of Hades can be seen in other pagan sarcophagi, e.g. at Side, and in Etruscan frescoes at Tarquinia. In this sarcophagus it is decorated with heads of Gorgons, as at Petra. 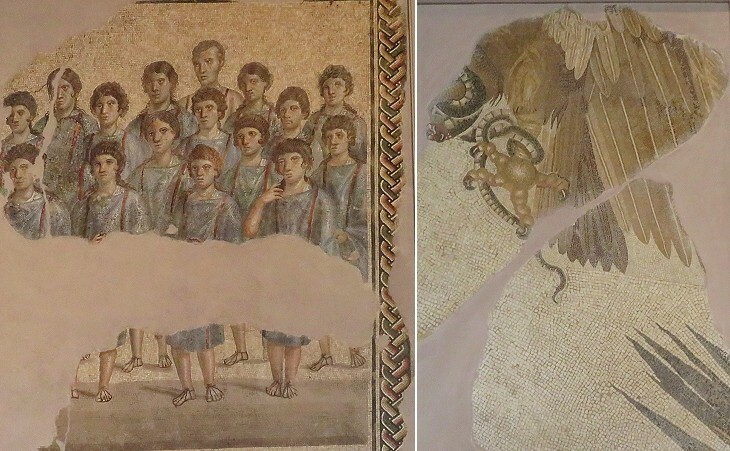 Only a limited number of fragments testify to the use of mosaics in Capua; many of them might have been destroyed carelessly by those who searched ancient buildings for statues, jewels and coins. The most interesting one was found in the Temple of Diana Tifatina, at the foot of Mount Tifata. At first sight it conveys the impression of portraying Christians singing a hymn, but liturgies based on chants existed already in pagan ceremonies. 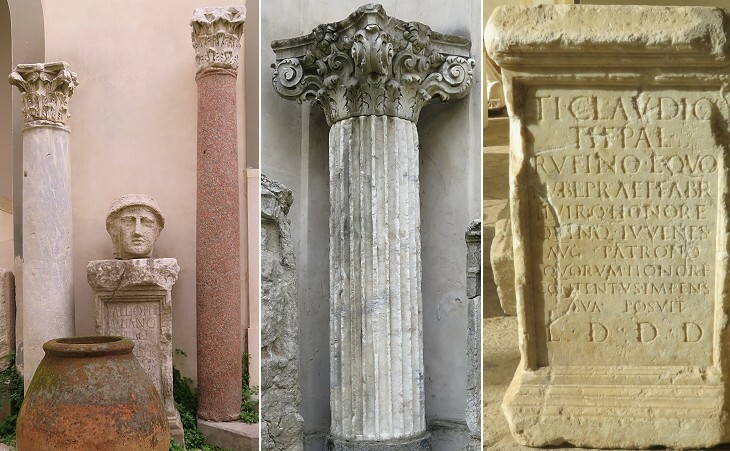 The stelae and inscriptions found at Capua were among the first ones to be listed in the Corpus Inscriptionum Latinarum (CIL), the systematic recording of all Latin inscriptions which was initiated in 1853 by the Berlin-Brandenburg Academy of Sciences and Humanities. Those at Capua were recorded by Theodor Mommsen and have been extensively studied by other archaeologists and historians. That of the Publilii raised interest because it refers to two freedmen who were portrayed in the stela and to two other freedmen who erected it. One of the latter is referred to as praeco (auctioneer, slave dealer), which suggests that all four men were involved in this trade on behalf of Publilius, their common master. The small relief in the lower part of the stela depicts the sale of a slave. The stela of the Marcii shows another group of freedmen (two of them being husband and wife). The two stelae show that the initial condition of servus (slave) did not prevent freedmen from acquiring a degree of wealth. 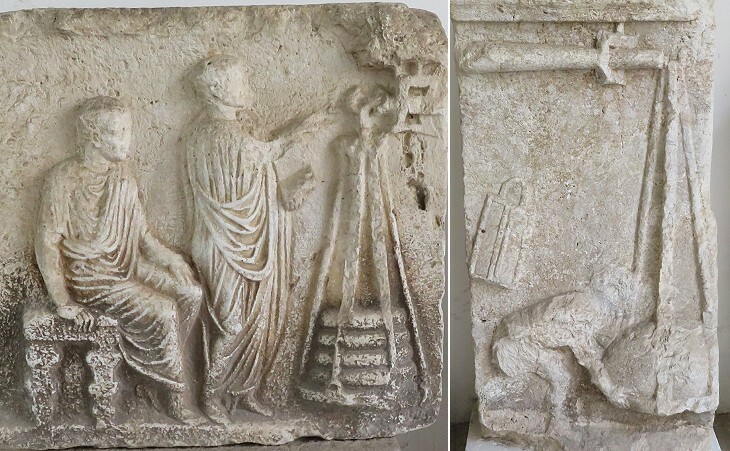 Other stelae are interesting for their reliefs which provide insights on the ordinary life of a Roman town. According to St. Isidore of Seville (Etymologiae, a sort of encyclopaedia of the early VIIth century) steelyards were first developed at Capua.